CUT New York, Chef Wolfgang Puck’s first Manhattan restaurant, fired up the outdoor grill again this year for the Taste of Tribeca, lower Manhattan’s food festival that supports arts and enrichment programs at public schools. CUT’s menu highlights various cuts of the finest beef from regions across the globe, as well as local seafood and an extensive international wine list with over 800 wines. This year, the team from CUT–Raymond Weber and Zairah Molina, a husband and wife duo who are executive chef and pastry chef, respectively– served grilled bone-in sirloin with Argentinian chimichurri. I sat down with the team to get their take on the event, their culinary dreams, and why they love food so much. Girls on Food: Why did you decide to participate in this event? Raymond: We at CUT really love being part of the downtown neighborhood–there is such a sense of community and we want to do our part to support it. We love the neighborhood’s history, and how quickly it is becoming both a residential and an emerging culinary destination. 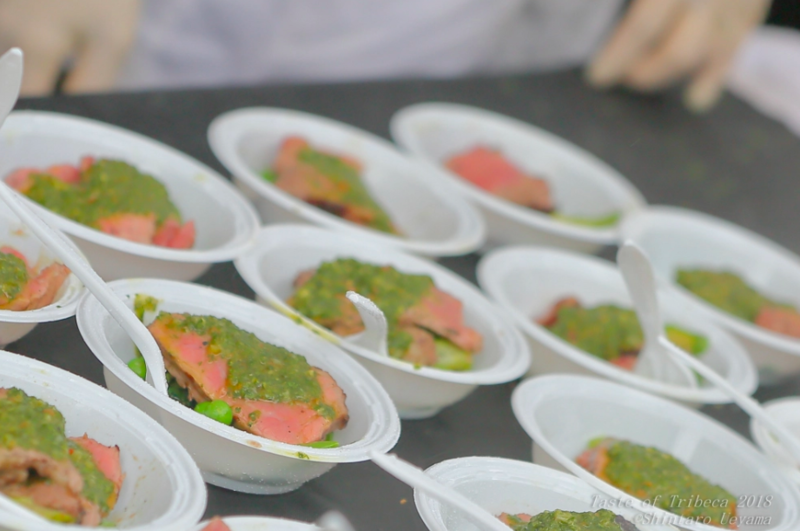 Zairah: Taste of TriBeCa is such a fun event, and supports a great cause! We’re excited to come back for our second year. GOF: What is your favorite thing to eat that isn’t yours? GOF: If you could go anywhere in the world for a culinary experience, where would you go and why? Raymond: Peru. The food scene is vibrant and energized, the produce is amazingly fresh and great to create with. GOF: Where do you get your menu inspiration? Zairah: At CUT NY, the menu is an adaptation of Wolfgang Puck classics combined with East Coast produce, seafood and meats. GOF: Why do you love being a chef in NYC? Raymond: NYC is full of all levels of restaurants from casual dining to omakase to long-standing institutions of fine dining–it has an energy to it unlike any other city. The constant change and competition of the culinary scene, combined with the challenge to be relevant, is what I love most about being a chef here. 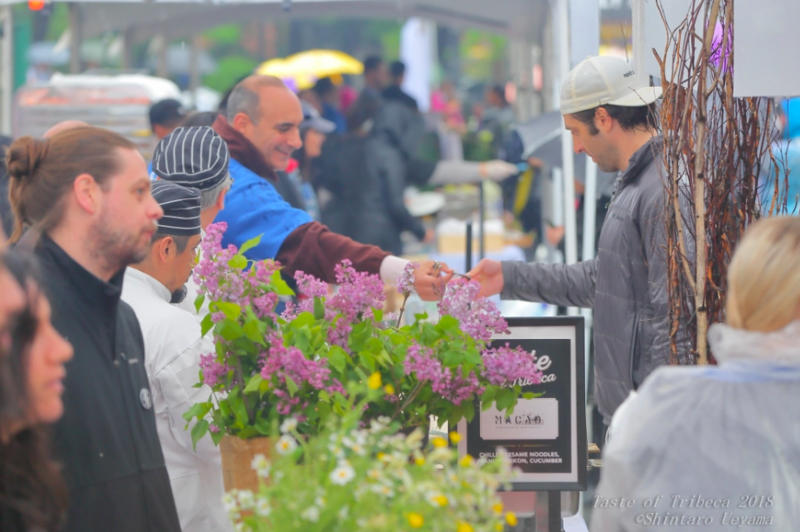 Be sure to follow Taste of Tribeca’s social media pages and keep up with them for next year! Some call me "The Cuban Carrie (Bradshaw)" because yes, I love love, fashion and hilarious conversations with my best girlfriends, but more than all that, New York City (and all it's yumminess), have my heart forever. I'm originally from Miami (of Cuban and Spanish descent) with a penchant for global cultures and cuisines. Whether those bold profiles come through a bite or a sip, I'm game for (almost) all things ingestible and imbibeable (is that even a word?). On most days (and nights and all hours in between), you can find me scouring the pages of culinary magazines and articles, online reviews, and of course, the proverbial self-proclaimed "foodie" Instagram profiles, in search of the latest and greatest in this wild world of food and beverage we live in. From fancy and fabulous to not so frilly, I'm a lover of ingenuity and insanity as it comes across on a dish, in a cup, or even suspended in the air (yes, presentation plays a big role sometimes!). Come along for the ride as I discover the Big Apple (and beyond) one bite, sip and 'gram at a time!